How to use personalisation in B2B digital marketing! Personalisation and marketing automation are now proven strategies in digital B2C marketing for increasing conversion rates and revenues. For example eConsultancy estimate that the suggest feature on Amazon.com generates an additional 10 to 30 per cent in revenues. Given the huge sales on Amazon this generates many millions of dollars for the company. B2B websites have been significantly slower to adopt personalisation. However, according to research by Forrester B2B buyers are increasing their use of digital channels to research and complete transactions while still using more conventional channels during the customer journey. Further, their experiences with B2C online sites has raised expectations of B2B sites so that buyers now demand much higher levels of service and personalisation during the user entire journey. Personalisation vs customization – How are they different? Enable B2B users with personalisation – Why it’s not all about selling in B2B? Getting data for B2B personalisation – What and how to get it? Choose a personalisation platform – What are your options? Segmenting your B2B customers – What strategies should you use? 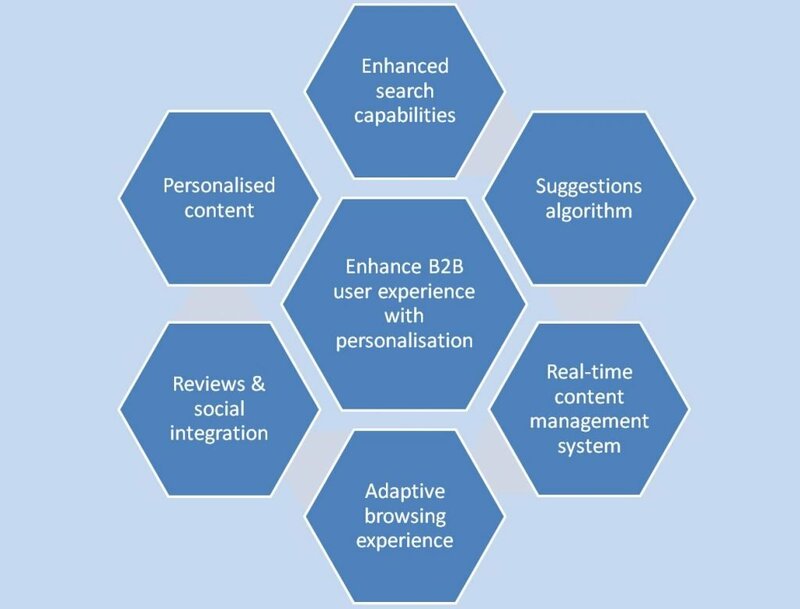 Implementing personalisation – Strategies for creating a personalised experience! When personalisation goes wrong – Why does personalisation sometimes go wrong? These two terms are often confused with each other. Customisation refers to where prospects are offered a distinct choice, perhaps to indicate their sector or occupation. This allows the website to respond to this selection by making the experience more relevant to the user’s needs. Customisation allows users to remain in control and select exactly what they want. The downside is that visitors don’t always know what they need or how a solution could improve the efficiency of their business. But customisation definitely has a place for many B2B websites, especially for first time visitors where you don’t know anything about their needs or the nature of their organisation. Personalization on the other hand refers to automatically serving content that is relevant to the individual visitor based upon data captured on the user. The advantage of personalization is that it does need any additional effort from the user because your automation platform does the hard work. However, this does mean you are reliant on the data and analytics of your marketing platform to identify or infer each user’s needs. In some cases this can feel a bit creepy as visitors find that the website is too good at anticipating their preferences. We’ll deal with this issue later after we examine how to personalise the B2B customer experience. B2B marketers have to target high-level decision-makers or a group of individuals and face a significantly longer business cycle than most B2C marketers. The B2B user journey is often has many more touch points and a complexity that appears to make personalisation more difficult to achieve. The solution to this challenge is to create a user experience that enables visitors rather than sells to them. The B2B buyer will normally have to consult colleagues and is often heavily influenced by peers outside their organisation. To facilitate this process it’s important to create a user experience that automatically adapts to the behaviour and interests of the visitor rather than trying to push them towards a purchase. Before you spend time and money on your data you should first identify what will be genuinely valued by your customer and what you need to know to achieve that. Start with the end in mind rather than the other way around. The difficulty faced by B2B marketers is combining data about an individual visitor with information held about their organization in a meaningful and actionable way. Further, it’s important to combine all types of data (e.g. quantitative or qualitative) and channels (e.g. offline and online) to capture information on all touch points to build a picture of the prospect’s behaviour and interests. Once you have the data you need you can begin to systematically generate inferences from your visitor and customer database to identify insights and create opportunities to personalise the customer experience. Sometimes expertise is underrated and companies recruit junior people with little experience. Saving money on personnel is counterproductive. A good data analyst or data scientist understands the capabilities of analytical and marketing automation tools. They know how to get the most value from your data solutions and can identify and develop new opportunities for personalisation without having to be given specific directions from marketing management. New vs returning visitors – Someone who has visited your site more than once in the last 24 hours is likely to different motivations and concerns than someone who visits your site for the first time. Even a simple welcome back message can acknowledge that you recognize their high level of interest in your product or service. Landing page type – Use your knowledge of the type of page a visitor lands on when they arrive on your site to personalize their experience by ensuring consistent messaging and content is displayed throughout the user journey. Don’t waste money on building dedicated landing pages if you are not going to use that knowledge to personalize subsequent screens with relevant content. Day of week / Time of day – Does a visitor who browses your site on a Friday afternoon have different intentions and motivations than someone who is browsing your site on Monday morning? What about weekend traffic – some businesses don’t close on a Friday afternoon – shouldn’t your content reflect this demand at the weekend? Conversion funnels – Where do visitors drop out of your funnel most often? Why not examine how you can personalize these stages in the process to improve engagement and reduce drop-out rates. Page load time – Why not acknowledge when your site is taking longer than normal to load by personalizing messaging or content to win visitors back. People like it when companies say sorry. IP address – Most medium to large companies have a unique IP address and so you should be able to identify key organisations to target from their IP address. According to a study by Gleanster for Act-On some 83 per cent of B2B marketers believe fragmented marketing platforms and systems prevent the implementation of marketing automation. This suggests that many B2B marketers either don’t have personalisation software or have not been able to fully integrate it with existing systems. Whatever your situation is begin by deciding what your goal is. Is it to increase the conversion rate of lead generation efforts, improve cross-sales, encourage repeat purchases or reduce cart abandonment? You can then set KPIs to monitor progress and begin considering personalization techniques. You can then start to look at what software is needed. There are generally two types of software available, A/B & multivariate testing solutions that offer personalisation as a feature and dedicated marketing automation software. The former include Adobe Marketing Cloud, Google Optimize 360, Optimizely, Oracle and Quibit. If you already have an A/B or multivariate testing tool check out its capabilities for personalisation as you may find this can meet some of your needs. Top dedicated personalisation software companies include Act-On, Acquia, Baynote, BevyUp, Boomtown, Certona, Dynamic Yield, Edgeverve, Evergage, Flytxt, IgnitionOne, Magnetic, nectarOM, Peerius, Real-Time, Syntasa and Strands. A key consideration here is finding a platform that integrates with your legacy systems and CRM solution in particular. Personalisation requires real-time access to data across all customer touch points and so it may be necessary to establish a network of technology partners who have the experience and knowledge to plug gaps where they exist in your internal capabilities. A popular strategy for creating a highly personalised customer experience is the buyer persona. This involves building a detailed profile of important user segments which includes demographic and firmographic data such as job title, function, management level, budgetary responsibility, and industry sector. IP address for large organisations to target individual companies. Geographical data such as city, region, country or seasonal factors. Behaviour on device (desktop, mobile and tablet). Demographics such as gender, age or cultural background. First party data – information that you have captured yourself and your customers are aware you hold. Third party data – information from CRM or social media and other third-party sources that users may not be aware you hold about them. The important point to consider here is to use experimentation to identify what works and what doesn’t for your prospects. Best practice is only a guide and should not be taken as gospel. 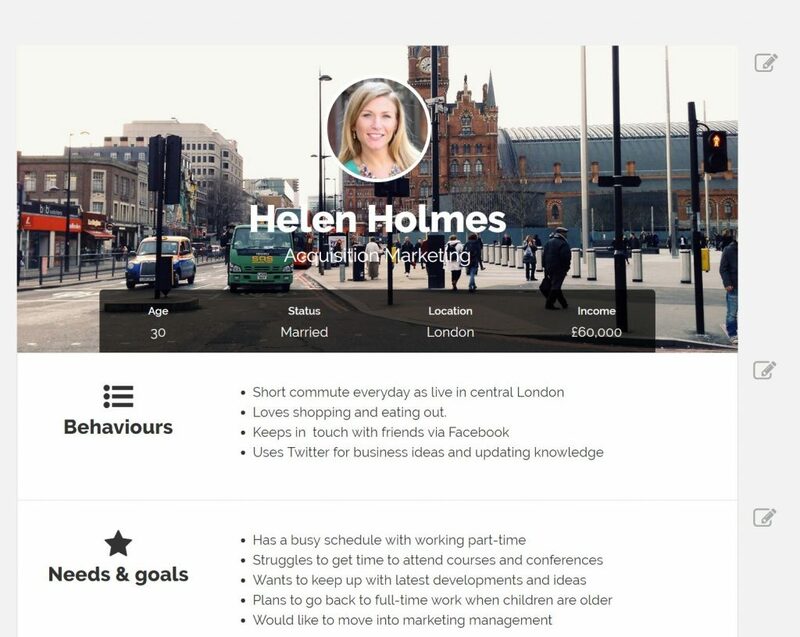 Now that you have your detailed buyer personas you can identify key characteristics or behaviours that allow you to allocate a visitor to a specific persona. 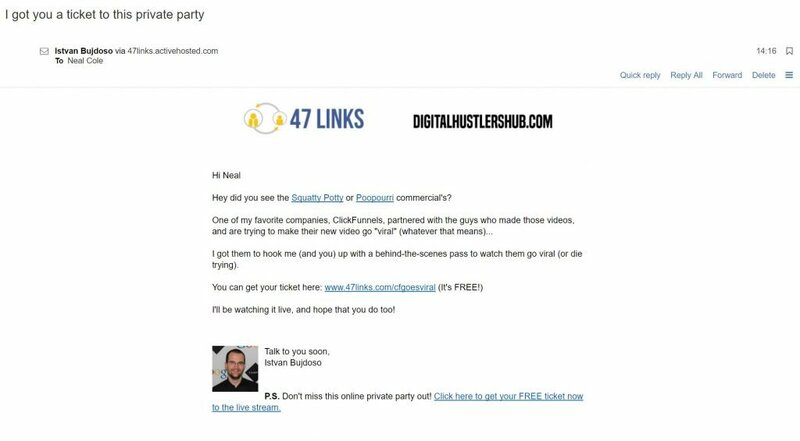 Use these criteria to segment your email list into, smaller, more targeted lists. This will allow you to deliver personalised email campaigns based upon important drivers of behaviour such as sector, job title and management level. Using your buyer personas to classify web visitors should also allow you to deliver a highly personalised web customer experience to replace generic and static web content that can often be a turn-off for users. As Karl Wirth, CEO of Evergage, points out there are four core principles of user experience which marketers need to consider. These are remember me, understand me, help me and surprise / delight me. Remember is about retaining and utilising information about the user’s behaviour or profile to deliver a personalised customer experience. This means acknowledging returning visitors and ensuring the user experience reflects past behaviour and previously captured on the prospect. Understand me relates to recognising returning visitors and applying the knowledge the organisation holds on customers to deliver content based upon their known interests and needs. Help me is about making it easy and enjoyable for visitors to achieve their goals. This involves monitoring user browsing behaviour and purchasing history to provide relevant recommendations and directing customers to useful information or recently viewed items. Don’t make it difficult for users to find what they are looking for. Surprise and delight may seem difficult to achieve online, but in reality this is what personalization is about. Going that little extra to acknowledge good customers and inform visitors of relevant and available offers can go a long way to make users feel valued. Buyer personas also make it easier for you to identify potential prospects in the social sphere. Listening to conversations people have on social media and having one-to-one dialogue with prospects can allow you to better understand their problems and needs so that you can tailor content accordingly. Engaging with prospects on social media demonstrates to your audience that you value their input and helps create the ultimate personalised user experience. Predicting behaviors is never easy and so it is inevitable that sometimes you will get it wrong. Poor personalization leads to a poor user experience. You can minimize this by doing extensive qualitative and quantitative research to better understand your audience and ensure your buyer personas are based upon real customer segments. Personalization should only be used when it’s helpful and has a clear benefit for the user. It should be intuitive, useful and create a natural user experience. It should not feel “creepy” or like Big Brother is watching you. It’s important to be open and transparent with customers about using data to personalise the user experience to manage expectations and reduce the chance that it becomes “creepy”. Personalisation can become problematic when organisations rely too heavily on inferred or purchased data that has not been freely given by users. When customers voluntarily give information or confirm the accuracy of data this reduces the likelihood that it will be perceived as “creepy” when it’s used to predict customer needs. 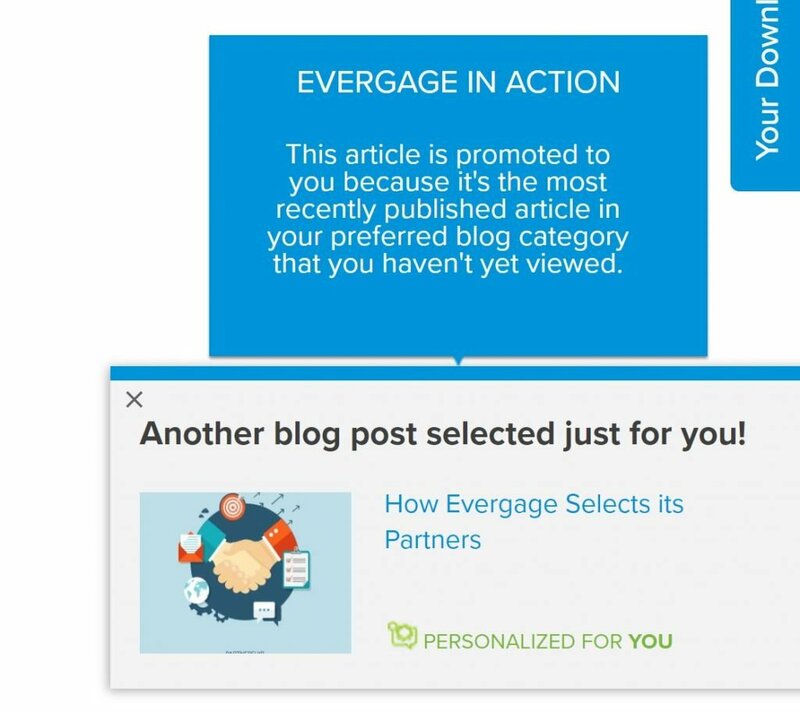 This example below of personalisation from Evergage allows the visitor to see why content has been recommended to them. This level of transparency helps to avoid personalisation becoming “creepy”. There also needs to be a value exchange for all concerned and so it is important to set out what personalisation means for different buyer personas or segments to fully understand the benefits for all parties. Holding user data is a privilege and so it is essential to set high standards for how it is stored and used. What will the customer’s attitude be towards us holding this data? What do we want the customer to do? Unless you can clearly answer these questions it is best not to use the information. In addition, ensure your data base architecture enables you to identify which data was given freely and which was bought from third-parties. Don’t forget to build in self-service alternatives by designing your information architecture to enable users to easily locate what they are looking for without having to rely on personalized content. This helps to prevent problems occurring when your personalization goes wrong. Personalisation should begin and end with what’s best for the customer. Set clear goals for what you want to achieve and invest in both qualitative and quantitative research to get a much deep understanding of what motivates your prospects. Create strong buyer personas based upon evidence to help guide your strategy. Avoid hoarding data for the sake of it. Always have a clear view of your objective and seek out data that allows you to achieve that goal. Give priority to data that has been given freely by visitors and don’t be over-reliant on making inferences from third-party data. The challenges of B2B personalization reinforce the need to have the right tools for the job. Even the best research and insight is of little value unless you have a platform that is capable of extremely fast delivery of content and is scalable. There will always be instances when personalisation doesn’t work and so build in self-service options to enable visitors to find what they are looking for. Avoid over-reliance on third-party data and be open with your visitors about how data is used. However, when used effectively B2B personalisation can be a powerful strategy for improving the customer experience and for increasing conversions. Just because the B2B decision making process is more complex this should not be a barrier to using personalisation to generate more revenues from your digital user experience.